Activists in Berlin will extend the application of pressure to the Cypriot government, demanding that the human rights of asylum-seekers in Cyprus be upheld according to European Union and international law. CODE e.V. has organized a protest action in Berlin in support of Iranian and other refugees in Cyprus for this Friday, 27 May 2011. The action will take place at the Embassy of Cyprus, Wallstraße 23, 10179, from 11:30-13:00. The International Coalition for the Rights of Iranian Refugees welcomes this action and encourages all human rights and refugee rights activists and other supporters in Germany to make every effort to join this demonstration. The announcement from the organizers appears below. Letters from the organizers describing the situation for asylum-seekers in Cyprus are also embedded below and appear in English, German and Farsi. Wir möchten damit auf die unhaltbare Situation der schutzsuchenden Menschen auf Zypern aufmerksam machen. Laut uns vorliegenden Berichten, Bildern und Interviews werden auf Zypern iranische Asylsuchende wie Kriminelle behandelt und unter menschenunwürdigen Haftbedingungen festgehalten. Die Asylanträge werden nicht in Übereinstimmung mit dem internationalen Recht behandelt und die fundamentalen verfahrensrechtlichen Schutzmechanismen werden nicht gewährleistet. Viele Flüchtlinge warten seit langer Zeit unter verheerenden Lebensbedingungen auf die Bearbeitung ihrer Anträge. Ihnen wird kein unparteiischer Dolmetscher zur Verfügung gestellt und vertrauliche Informationen werden an die Botschaft der Islamischen Republik weitergeleitet. Den Asylsuchenden droht die Deportation ohne Recht auf Einspruch. Schwerstkranke Menschen werden nach Ablehnung ihres Asylantrages nicht mehr medizinisch versorgt und ihnen wird jegliche humanitäre Hilfe entzogen. Wir protestieren gegen das menschenrechtswidrige Verhalten der zypriotischen Regierung und bitten um Eure Unterstützung. English translation of a letter sent to the Cypriot Embassy by CODE e.V. We are writing this letter to bring to your attention the intolerable conditions under which Iranian asylum seekers live in Cyprus. Our organization, the Color of Democratic Election, monitors and reports on human rights violations in various countries around the world. We now turn our attention to refugees’ conditions in Cyprus and write to you about it. We hereby object to the inhuman manner in which your government has been treating asylum seekers in Cyprus. It is universally known that when dissidents are arrested, tortured, and executed in their own countries, they are forced to leave their birthplace and seek asylum elsewhere. 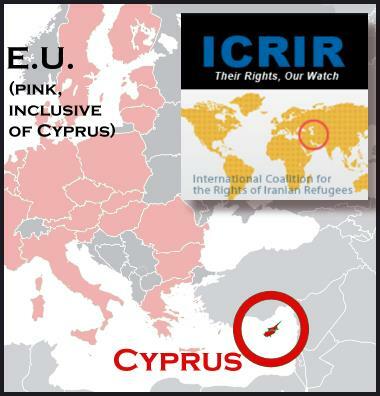 Iranian refugees in Cyprus have come to your country for precisely the same reasons. According to the reports and documents that we have received, the government of Cyprus treats Iranian asylum seekers as if they are criminals, imprisoning some of them under deplorable conditions. Additionally, requests for asylum aren’t processed according to international laws. A large number of asylum seekers, especially those who are from Iran, have been waiting for your government to process their applications for years. While asylum seekers are interviewed to determine their eligibility for immigration benefits, the government of Cyprus denies them access to an impartial translator. Instead, by utilizing a translator who is also employed by the Iranian Embassy, asylum seekers’ personal and confidential information has been compromised. Currently, asylum seekers are in danger of being deported while they are denied the right to defend themselves. If deported, the refugees will face imprisonment, torture and execution once they are returned to Iran. It has also been brought to our attention that after a refugee’s application for asylum is rejected, he is denied medical care even if he is gravely ill. This is immensely tragic and against the Universal Declaration of Human Rights. Ms. Elahe Rahimi is one of such refugees. She is a forty year old woman whose name and story is now known all over the world. Ms. Rahimi suffers from a life threatening illness for which she was taken to Limassol Hospital. On May 5, 2011, she was discharged from hospital and denied medical care because her request for asylum had been rejected. At the end, we ask you once again to stop violating refugees’ human rights and call for the government of Cyprus to help the asylum seekers promptly by making the necessary changes in your policies to treat them compassionately. We thank you in advance for answering to our call. « ICRIR: URGENT ACTION REQUIRED: Stop Illegal Deportation of Hussein Gafeel Hwaees from Iraq to Iran!